Growing beets in your garden has many benefits. Beets are rich in anthocyanin pigments. 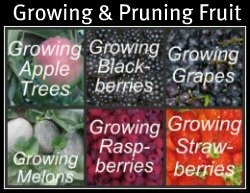 Anthocyanins act as powerful antioxidants. I can’t pronounce the word either, but it means that eating beets helps you to get healthy and stay healthy. 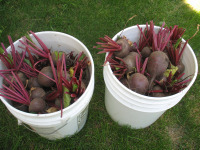 Beets are easy to grow and don’t take up much room in the garden. You can start eating the little beets and nutritious beet greens early in the season. Canned beets taste wonderful all winter. You can also store fresh beets in the vegetable pit. 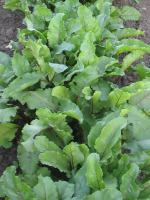 Beets are semi cold hardy and should be planted a few weeks after the cold hardy vegetables. In central Utah, that's around the first of May. Plant your beets in fertile, loamy, garden soil. See Types of Soil. When you plant your beets, plant a double row. A double row has two rows of beets that are only 4” - 6” apart. It saves space and water. Run a drip-line in between the two rows. If you’re planting a lot of beets, you can plant three or four rows that are only 6 inches apart from each other. If you’re short on garden space, you can plant radishes in between the two rows of beets. The radishes mature in about 30 days and are pulled out before the leaves of the beets get too big. The radishes don’t interfere with the growth of the beets. If you’re planting beets just so you can harvest and eat the young beet greens, you can plant the beets in between two rows of carrots or onions. There are several varieties of beets to choose from, but I personally prefer the Dark Red Detroit variety. They have a nice round shape and store well in the root cellar. Plant your beet seeds directly into the garden. 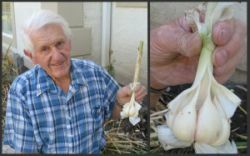 The seeds should be planted about ½” – 1” deep. Be sure to keep the seeds moist so that they'll germinate. If you put a layer of manure mulch (about 1” thick) over the planted row, it really helps keep the beet seeds moist. See Garden Watering Systems. You’ll need to thin your growing beets after they’ve established a root system. 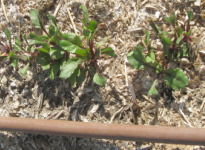 Pull out the beet plants that are too close together. The beets should be spaced 2” - 3” inches apart. Thinning the beets gives room for the beets to mature and grow. 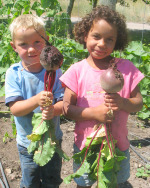 You can eat the young growing beets and beet greens that you pull out of the garden. Chop them up and eat them in a fresh salad or eat them lightly steamed. You don’t have to thin all your beets at the same time. Thin out a few of the extra beets each day and eat them for dinner. One of the pests that can sometimes become a problem with beets is a little worm. This worm gets inside the leaf between the top and bottom layers. If not controlled, it will destroy the leaves and inhibit the growth of the beet plant. “Sevin” (a pesticide) will control it. Here’s an organic way of controlling the worm: Spray a soapy water solution on the plants every few days until the young worms are killed. This same worm will grow in Swiss chard and Silver Beet. After the plants are more mature these worms don’t seem to cause a problem. As the growing beets begin to mature, you can decide what size of beets you want for canning or freezing. Beets that are about 1” - 1 ½” in diameter are a good size to use. Harvest all your beets at the same time. Leave a 1” - 2” stem when you cut off the beet greens. You can make pickled beets, can beets, dehydrate beets, or freeze beets. You can also store fresh beets in a root cellar. They will stay fresh for most of the winter.